Animal bites are not uncommon occurrences. However, victims who are treated in emergency centers represent only a small percentage of all bite victims. Although notification is mandatory in many states, an estimated 50% of all dog bites are not reported. See the image below. 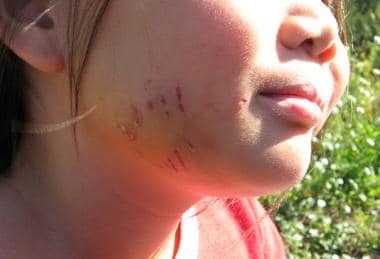 The child in this photo sustained a dog bite to the face. Courtesy of Wikimedia Commons, Tanner Ford, TRFPhotography. Most animal bites are dog bites (80-90%). Cat bites make up approximately 10%, and bites from miscellaneous animals and rodents also contribute to these figures. Most animal bites occur on the extremities, but the head and neck region is also often affected. Animal bites to the face are most commonly made by dogs or cats. Of all dog bites, 9-36% occur to the head and neck region. The head and neck region is injured in 6-20% of persons who sustain cat bites. Children are injured more frequently in the head and neck region than adults. Although the risk of infection exists in any bite situation and proper wound management is required, animal bites to the head and neck require special considerations. The intimate juxtaposition of vital structures and the cosmetic issues of the head and neck region warrant special care for animal bite wounds to these areas. In studies from England and Scotland, animal bite injuries account for 3% of emergency department visits. In Switzerland, up to 23,000 people are treated for animal bites and scratches annually. Animal bites can lead to infection. Approximately 20% of dog bites in children become infected; the rate of infection of cat bites in children varies, but can reach 50%. This consequence can be avoided, however, with appropriate treatment. Other animal bite complications include sepsis, osteomyelitis, septic arthritis, and even death. Fatalities are uncommon, but an average of 10-15 deaths occur following dog bites each year in the United States. Most of these fatalities are children who sustain bites to the head and neck region. Even a minor bite to a major vessel can lead to hemorrhage in a small child. Skull fractures resulting from dog bites have been reported. Epidemiologic data have failed to demonstrate an association between race and bites. Animal bites occur more frequently in adults. However, children have a higher percentage of head and neck bites. Additionally, bites in children are more likely to warrant medical attention. The breed of the dog has been reported for some bites. Most bites (>50%) are inflicted by working dogs, which includes German shepherds, Doberman pinschers, collies, Great Danes, huskies, and mixed shepherd-type dogs. Sporting dogs, such as spaniels, retrievers, pointers, and setters, are implicated less frequently. Cats are not typically identified by breed. Kumar R, Deleyiannis FW, Wilkinson C, O'Neill BR. Neurosurgical sequelae of domestic dog attacks in children. J Neurosurg Pediatr. 2017 Jan. 19 (1):24-31. [Medline]. Bula-Rudas FJ, Olcott JL. Human and Animal Bites. Pediatr Rev. 2018 Oct. 39 (10):490-500. [Medline]. Holzer KJ, Vaughn MG, Murugan V. Dog bite injuries in the USA: prevalence, correlates and recent trends. Inj Prev. 2018 Jul 23. [Medline]. Garvey EM, Twitchell DK, Ragar R, et al. Morbidity of pediatric dog bites: a case series at a level one pediatric trauma center. J Pediatr Surg. 2015 Feb. 50(2):343-6. [Medline]. Pfortmueller CA, Efeoglou A, Furrer H, et al. Dog bite injuries: primary and secondary emergency department presentations--a retrospective cohort study. ScientificWorldJournal. 2013. 2013:393176. [Medline]. [Full Text]. Tabaka ME, Quinn JV, Kohn MA, et al. Predictors of infection from dog bite wounds: which patients may benefit from prophylactic antibiotics?. Emerg Med J. 2015 Jan 29. [Medline]. Babovic N, Cayci C, Carlsen BT. Cat bite infections of the hand: assessment of morbidity and predictors of severe infection. J Hand Surg Am. 2014 Feb. 39(2):286-90. [Medline]. Chu AY, Ripple MG, Allan CH, et al. Fatal dog maulings associated with infant swings. J Forensic Sci. 2006 Mar. 51(2):403-6. [Medline]. Toure G, Angoulangouli G, Méningaud JP. Epidemiology and classification of dog bite injuries to the face: A prospective study of 108 patients. J Plast Reconstr Aesthet Surg. 2015 May. 68 (5):654-8. [Medline]. Rezac P, Rezac K, Slama P. Human behavior preceding dog bites to the face. Vet J. 2015 Dec. 206 (3):284-8. [Medline]. Wu PS, Beres A, Tashjian DB, Moriarty KP. Primary repair of facial dog bite injuries in children. Pediatr Emerg Care. 2011 Sep. 27(9):801-3. [Medline]. Gurunluoglu R, Glasgow M, Arton J, et al. Retrospective analysis of facial dog bite injuries at a Level I trauma center in the Denver metro area. J Trauma Acute Care Surg. 2014 May. 76(5):1294-300. [Medline]. Disclosure: Received income in an amount equal to or greater than $250 from: IMEDECS, MAXIMUS, HHC, MSLA, MRIOA.